Veterinary nutritionists are veterinarians who have been board certified to practice medicine with a focus on the specialty area of animal nutrition. Routine duties for a veterinary nutritionist may include tasks such as evaluating body condition, formulating diets for healthy animals, creating special diets to prevent and manage diseases, balancing complete rations for animals involved in performance or production, overseeing veterinary nutrition technicians or other staff members, and providing specialty consultations at the request of general veterinary practitioners. Veterinary nutritionists may have additional teaching and advisory duties if they work as lecturers at a veterinary college. Corporate researchers also will have additional duties related to product development, nutritional analysis, and clinical trials. Veterinary nutritionists may also give lectures for professional continuing education credits or to educate members of the public about nutritional topics. Nutrition is one of the specialties in which veterinarians can become board certified diplomates. Veterinary nutritionists may choose to specialize even further by working with one particular species or a specific category (such as small animals or large animals). Veterinary nutritionists may work in corporate positions with animal feed or supplement manufacturers, in clinical practice, in research laboratories, or in academia. Veterinary nutritionists must first be accepted into an accredited veterinary college to complete their Doctor of Veterinary Medicine degree. After completing their DVM and becoming a licensed practitioner, a vet is able to begin the path to board certification in the specialty field of nutrition. In order to be eligible to take the board certification exam in the specialty of nutrition, a veterinarian must fulfill all prerequisites. The candidate must have completed at least three years of training under the supervision of a board-certified nutrition diplomate and submit three detailed case study reports for evaluation. The three years of training must consist of at least one year of internship or clinical experience and two more years of residency (consisting of a combination of teaching, research, and clinical practice of veterinary nutrition). After passing the comprehensive board certification exam administered by the American College of Veterinary Nutrition (ACVN), a veterinarian will be granted diplomate status in the specialty of nutrition. Diplomates must also complete continuing education credits each year to maintain their board-certified status. These credits can be satisfied through attendance at lectures or specialty conventions. 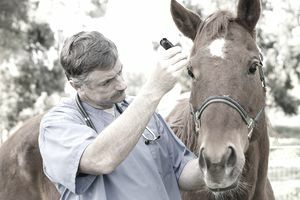 The Bureau of Labor Statistics (BLS) does not separate specific salary data for the individual veterinary specialties, but board-certified specialists earn top salaries due to their extensive experience and qualifications. Veterinary nutrition is often amongst the top paying specialties due to the fact that many diplomats command top salaries from corporate entities such as feed and supplement manufacturers. Aspiring veterinary nutritionists do earn a salary while completing their residencies, though this compensation is generally much less than a veterinarian can expect to earn in clinical practice. Veterinarians who achieve board certification should continue to have particularly strong job prospects and a high earning potential in their field of expertise. The demanding nature of specialist training programs and the difficulty of board certification examinations ensure that only a handful of professionals are able to achieve board certification each year. Demand for veterinary nutritionists will only be enhanced by the scarcity of board-certified professionals in this particular veterinary specialty.